As the months on the calendar continue to fall off far too rapidly and the years start to sound more like a science fiction setting rather than the present, the year 2001 starts to remind me less of the Kubrick masterpiece and more of a time long since passed. While I recall the memories of things that will be impossible to forget, like the surreal day in September in which America was attacked, very little of what I personally experienced back then will register in my mind ever again. 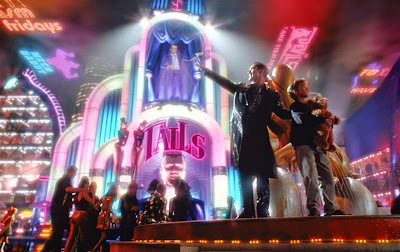 I was 17 years old and the days I lived then all blur together in a mess of underage alcohol consumption and raging hormones, but oddly enough I have carried a hatred for a specific film with me for over thirteen years now: A.I. Artificial Intelligence. The strange part is, I could no longer even remember why I hated it so much. I had seen it with friends when it opened in June of 2001, and I recall walking in with expectations of a grand, wildly imaginative science fiction masterpiece, and walking out bitching about the ending and the way it was "too long" and "boring". All these years later and I still found myself scoffing at the film when I would see it receive praise, and it occurred to me that I have forgiven people I actually had reason to dislike back then in recent years. I have transformed from a turd teenager to a 30 year old man with a 7 year old daughter since my one and only viewing of A.I. Artificial Intelligence. Wasn't it about time I gave the film a second chance? While still not a masterpiece, A.I. Artificial Intelligence is certainly grand and wildly imaginative and I feel a bit of shame for holding such an odd grudge for 13 years when I could have been revisiting it and discovering the reasons to embrace it instead. The original vision of this film came from the master himself Stanley Kubrick all the way back in the 1970's, but he simply could not get the project off the ground, having issues with the quality of special effects available to him. 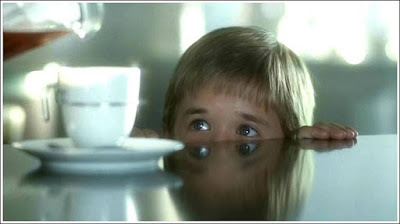 Kubrick felt that they would not be worthy to create the child android character of David appear human enough, which is mandatory for the narrative. It wasn't until 1995 when Kubrick decided to hand the project off to good friend Steven Spielberg, and even then nothing moved forward until Kubrick passed away in 1999. While Kubrick never got the chance to see his finished vision finally put to celluloid, I now believe he would have been proud of what Spielberg achieved. I was blown away by how strong the visuals of the film stand up in 2014, which seems like a silly statement when referring to a film only released 13 years ago, but the progression of the quality of effects available continues to unfold rapidly and yet A.I. feels as if it could be put into cinemas today and no one would ever know the difference. The performances of Haley Joel Osment and Jude Law are hauntingly on point for the android roles they are playing, and the Pinocchio inspired story is constantly compelling and heartbreaking, which is ironic because while I shed tears for the pain of David, in truth David is feeling no pain. He has no heart, he has no soul, and yet I wanted nothing more than for him to find the blue fairy and become a real boy. If Kubrick picked Spielberg because he felt he was the correct choice to make the audience connect so deeply with something not human, much the way we did with an alien in E.T., than he certainly got it right. While the film may suffer from a small amount of flaws, the depth of how I connected to it on an emotional level was not one of them. Speaking of those flaws, only one thing I recall feeling way back in 2001 still registered with me this time around and that is with the pacing. I don't know what it is exactly, but I was totally invested in the first and second acts of the film, but by the third act which takes place in a far distant future I felt myself fading away from the work a bit. A.I Artificial Intelligence went from a riveting, joyous ride to a bit of a lean back in my seat and check the clock to see how much more was left experience, and I cannot be certain whether this is truly the fault of the film or if I should be taking issue with myself as the viewer. I suppose a third viewing will be what makes or breaks this issue with my drifting away during the final thirty or so minutes. Also, while it only comprises of about seven seconds of screen time, there is a sequence where Chris Rock does a voice cameo and it really feels out of place. I don't understand creative decisions like this, because it really wasn't amusing and it certainly didn't add anything to the film and yet it was a jarring reminder that I was indeed just watching a movie. I prefer to let the experience overtake me, when I lose sight of what is fact and what is fiction and instead just get swept away in the story, but little things like celebrity cameos meant for nothing more than a giggle or a talking point don't sit right. As a massive fan of the science fiction genre, I will not be quickly moving A.I. Artificial Intelligence to the top of any all time lists, but I certainly regret not finding time for a second viewing sooner and recognizing how silly my hatred was. For the most part this is a masterfully handled film with depth and passion seeping out of every pore. If you are like me with this or any other highly regarded picture, carrying with you the negative energy of a bad cinematic experience for years, I suggest you sit down with an open mind and give it a second chance. I'm thrilled I did.